Nessy needs to be prepared for cruising down the Thames with the Home Built Boat Rally from Lechlade to the Beale Park Boat Show. First requirement is to rig a tent. The proper thing to do would be to order one from a sailmaker, but that is not the HBBR way. The HBBR way is to get a length of canvas and stitch a tailor-made tent, but I'm too cheap even for that. 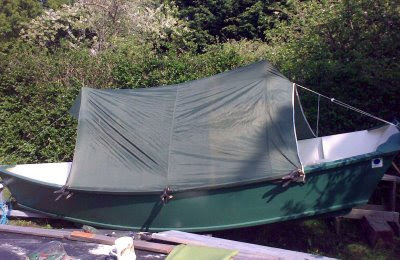 So I got the fly from a tent I bought cheap at Millets thirty years ago, and clamped it to the gunwales with spring clamps (Tesco, 30p each). Works a treat. Now all I need is some floorboards, a box of Wagbags and a towel and I'm set. Had to google what a wagbag was! Just been out in the Echo!!!!!!! I assume that's you, Brian! If so, congratulations on getting out in Echo and I hope it did your back good. Yes. Back seems ok. Neck a bit stiff with looking round to see where I was going. Echo do a small mirror that fits the footbar.